Spoof news: Ace Your Job Interview! 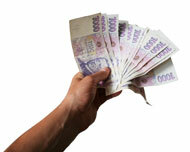 Earn money with a job! During these cash-strapped, under-nourished times when most people smell like tears and Special Brew it can be useful to find gainful employment and start earning money. Like most worthwhile things in life, getting a job requires hard work, dedication and begging on your knees like a dog. Buy a suit and wear it on the day of your job interview. The more eye catching your suit the more chance you have of standing out from the crowd. Try dazzling lilac and sky blue tones topped off with a sprinkle of glitter. Alternatively you could catch their eyes by simply catching their eyes with your bare hands and physically turning their eyeballs until they are looking at your face. Remember to smile. The more research you do before your job interview the better equipped you will be to answer questions. Find out the name of your future boss and if possible where they live and their hobbies Try hiding in the bushes outside their home for a week and find out detailed information you can later reveal. Remember to pack a camcorder and notebook. You must show you are the best person for the job. For example- if the job requires someone who is good at typing make sure you are an asset to the company by simply breaking the other employees fingers until you are the only option. Similarly if the job requires good people skills or good hygiene just smear your co-workers with shite and tell your boss they touched you in your 'special area.' The job will be yours in the time it takes to file a police report. Everyone appreciates good manners. The best way to ace a job interview is to remember the basics of 'please' and 'thank you.' Such as 'please give me this job…thank you for seeing me…' The louder and more often these phrases are repeated the better your chances of success so remember to shout and repeat until the job is yours. Lastly you must remember to relax. After all- its only a job! A stressed employee is no good to anyone. So try and stooping and shambling into the interviewers office in a relaxed, casual manner, perhaps on all fours, light up a joint, fart, speak in slang terms like 'yo big daddy' and ''s'all good ma hommie,' and perhaps try a bit of yoga during the interview to loosen your joints. If these tips are followed to the letter you will end up with a job, respect and most importantly money. I hope you will of course remember that it was my advice that got you this job and that you will reimburse me for my efforts generously. Just send a tenner, or even just a fiver, or only £1.69 for a can of special brew. Then read my handy tips on pretending to work whilst merely gossiping and drinking coffee and my handy tips on not getting fired after you've got caught with your knob on the photocopier.